Imagine a world where you see others engaged with their environment, freely moving from one space to another — yet you are unable to participate because of an unlikely barrier: a few cement steps in your way. Seen from this light, even a single step can mean a significant barrier to entry for those with handicap accessibility — the difference between inclusion and isolation. Whether walking around town or on a trail, most of us wouldn’t think twice when it comes to seeing a stairway or a short and steep incline. However, from the perspective of someone that requires a wheelchair or other form of accessibility aid, that environment begins to look very different. The Americans with Disabilities Act was passed in 1990, ensuring all new businesses would have handicap accessibility and public spaces received modifications to become accessible by a wheelchair. Part of a broader national initiative, large organizations like Google made the move to add accessibility information to Google Maps in 2016. Met with favorable reception, the company recently added upgrades and increased information in 2017 with help from crowdsourcing information to enhance the dataset it works with. While some communities have adapted through a ‘culture of compliance’ with regulations around adaptability guidelines, other initiatives and groups have sought to automatically include it in design to begin with. Aiming to be a part of the latter group, Midland has sought to factor accessibility of public places into design and none more than the community’s outdoor spaces. 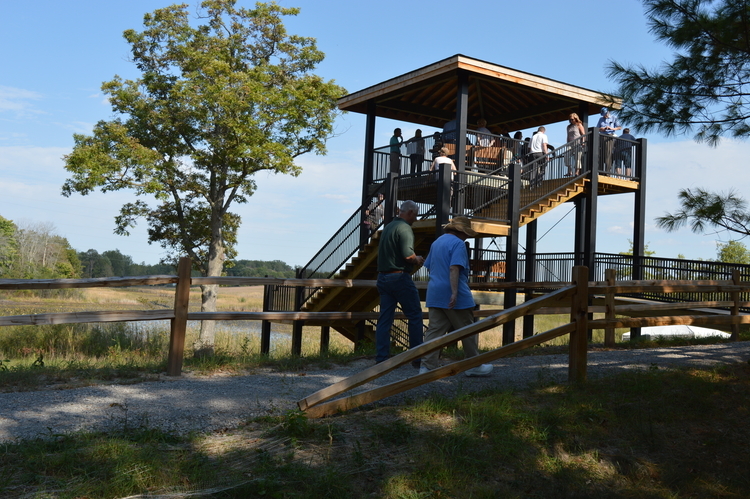 Visitors can see the pond at Whiting Forest from this new accessible overlook. Particularly, Midland has worked to design and improve many of the city’s amenities, and in some cases incorporating accessibility as part of the design, especially when it comes to outdoor experiences. Here are some of the accessible spaces Midland has to offer. Just a few steps away from the Pere Marquette Rail-Trail in Midland, you’ll find the Averill Preserve, almost 74 acres and more than 6,000 feet of the Tittabawassee River shoreline. 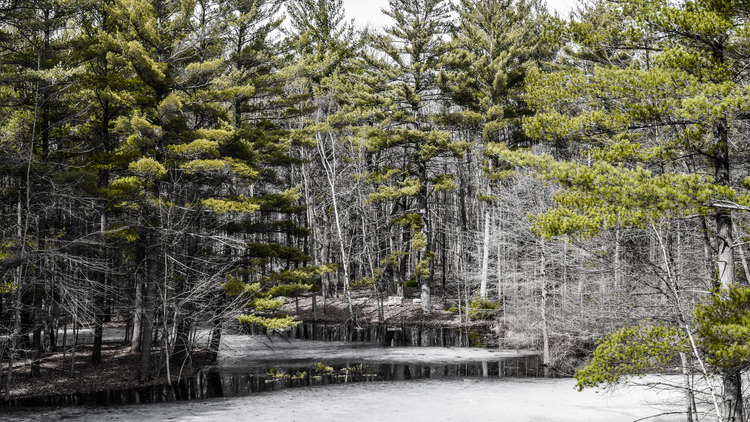 Given to Little Forks Conservancy by Midland Area Community Foundation in 2003 and expanded in 2004, the Averill Preserve recently announced plans to incorporate the first accessible trail. 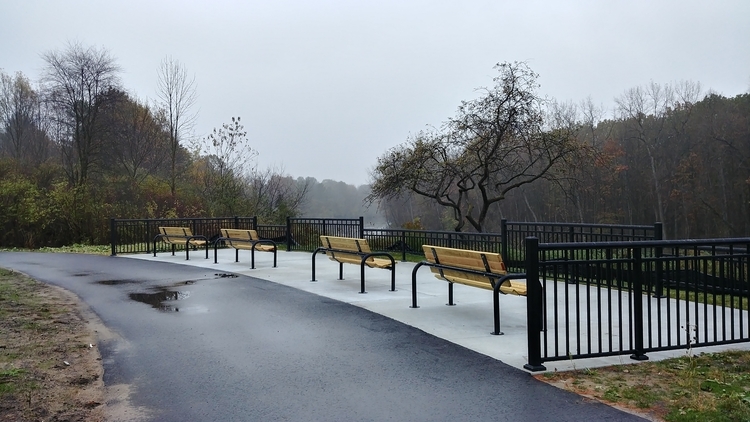 The project is approximately 90 percent complete, with the path and overlook already open and accessible to the public. Little Forks is in the process of installing wayfinding and interpretive signage, a nature play area and plantings with help from the Chippewa Nature Center. Importantly, there will be a seasonal, ADA-accessibly porta-potty near the parking lot, one of the few remaining amenities to be installed as the group looks forward to a May 2018 grand opening. A community effort, upgrades to the Averill Preserve came from an investment over $150,000 made by community members, businesses and the Saginaw Bay Watershed Initiative Network. Several area foundations also supported the project including the Herbert H. & Grace A. Dow Foundation, the Rollin M. Gerstacker Foundation, the Charles J. Strosacker Foundation, the Midland Area Community Foundation and the Bay Area Community Foundation among many others. You can learn more about the enhancements underway at the Averill Preserve in the video at the top of the page (or a larger version here) featuring Greg Yankee, Executive Director of the Little Forks Conservancy. Little Forks will be working on an outreach program for the preserve to connect with local community groups to raise awareness for the accessibility enhancements, including Mid-Michigan Disability Network, Senior Services, ARC of Midland and others. When Whiting Forest at Dow Gardens officially opens in 2019, the current sweeping garden views over a mile in length of ADA hard-surface pathways will extend by another 1.45 miles. The additions will include ADA accessibly boardwalks, bridges and a canopy walk that reaches four stories high as well as a visitor center, cafe and playground. 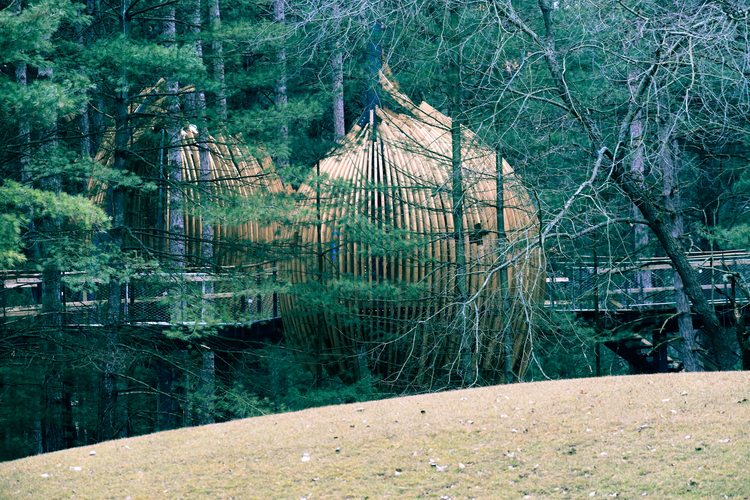 The facility truly prioritized creating a universally accessible experience into the design and the pathways that lead up to the canopy utilize a smooth, low-grade, aggregate concrete surface in open areas and porous pave material in the forest, primarily made of recycled rubber. 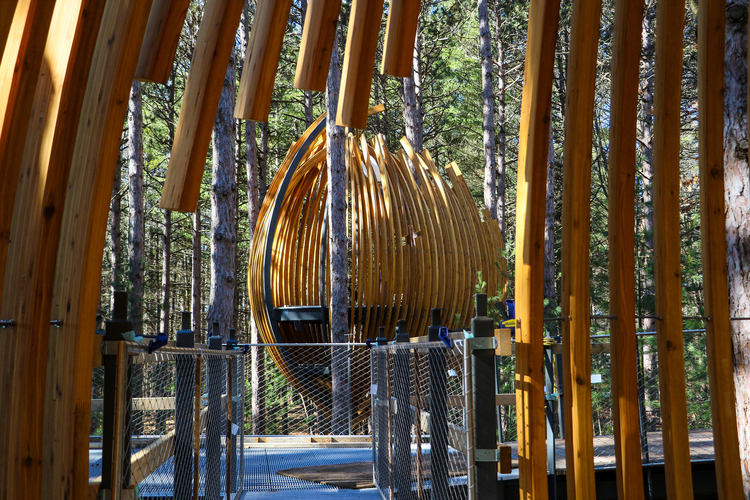 The canopy itself is accessible as well, welcoming visitors of all ages and needs to experience three overlook platforms that allow visitors different views of the orchard, pond and spruce trees. 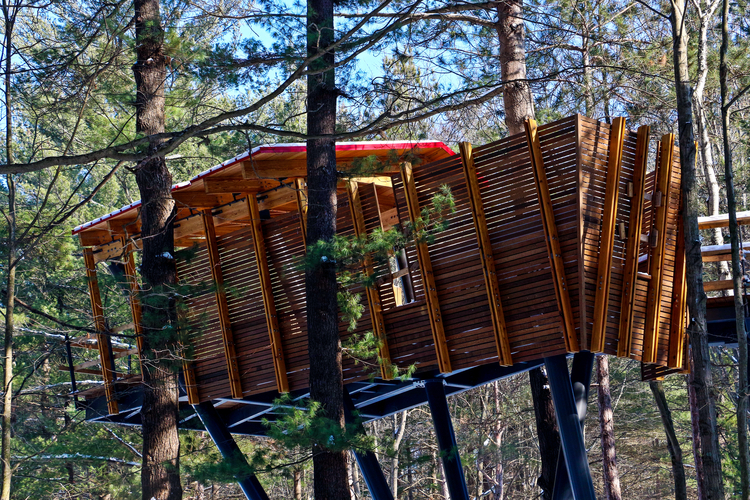 Unique in concept and design, Whiting Forest will allow users with accessibility needs possibly their first experience of being ‘up in the trees’. A sleek and accessible shelter on the Whiting Forest path. In the playground area, visitors will find an accessible water feature, swings and picnic tables along with many other attractions. The pods at Whiting Forest are surrounded the pond. The new features at Whiting Forest will join the barrier-free and hard surface loop around the Dow Gardens Conservatory added in 2012. The Conservatory houses over 3,000 butterflies during the spring months each year. ‘Accessibility Days’ were established a few years ago which offer senior living centers discounted rates and prioritized parking by reservation. Chippewa Nature Center is involved with the Access to Recreation Committee, an initiative of the Midland Area Community Foundation along with many other facilities in Midland including the West Midland Family Center and the Greater Midland Community Center. Accessibility at Chippewa Nature Center takes on many forms and showcases several of Midland’s attractions to visitors. Winding through wetlands and the Chippewa River, you’ll find the Chippewa Trail, a 3.5 mile long stretch of paved bike path that connects the Nature Center to Downtown Midland that was commissioned in 2006. 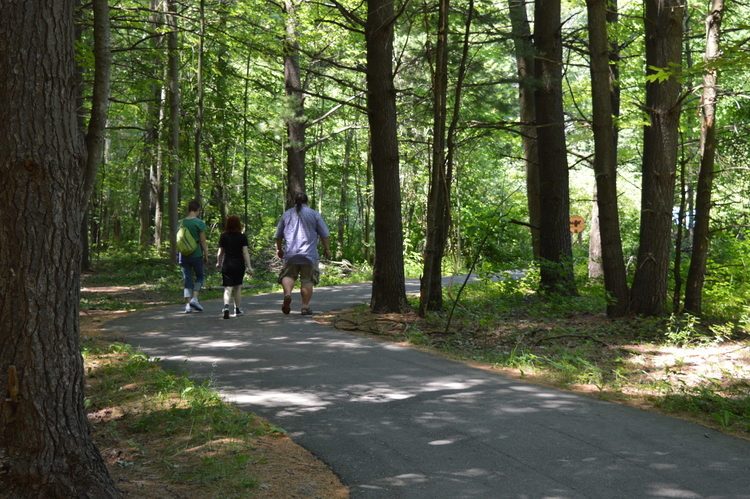 There are numerous trails at Chippewa Nature Center as well. The longest ADA accessible route is the Arbury Trail running a half mile long near the CNC’s Visitor Center. It gives visitors a nice view of the river and is close to the parking lot. This year marks the first full year of operation of a newly installed observation deck overlooking the wetland area at CNC. First available to the public in September of 2017, the Center is excited to have the 33-foot-tall observation deck available during the summer months this year. Notably, halfway up the tower, visitors will find an ADA accessible platform. Wetlands overlook at Chippewa Nature Center. The deck originated at Whiting Forest and was donated to CNC with the funding for the move provided by The Herbert H. and Grace A. Dow Foundation, The Harry A. and Margaret D. Towsley Foundation, Consumers Energy Foundation and the Midland Area Community Foundation. 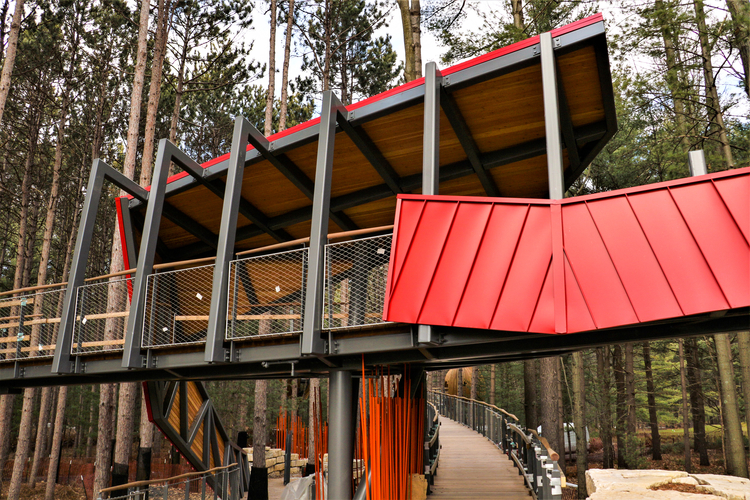 “At CNC, we try to remove barriers to experiencing the beauty and power of nature — whether those barriers are financial, accessible or otherwise,” says Dennis Pilaske, Executive Director of the Chippewa Nature Center. The Center and other local partners like Midland Parks & Recreation ensure that the community can enjoy the water with ease of access as well. Open May through October, there is a universal access kayak launch just west of M-30 on Chippewa River Road. Users can go to and from a similar launch in Downtown Midland at the Tridge. 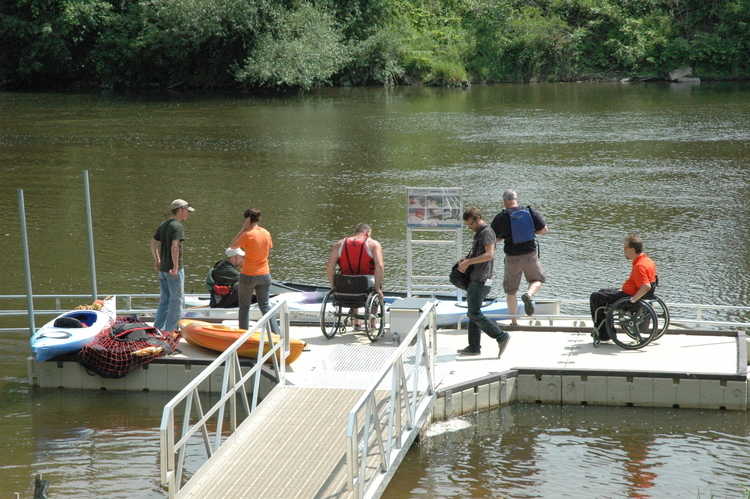 There is another ADA accessibly launch at Sanford Lake Park, an initiative of Midland County.